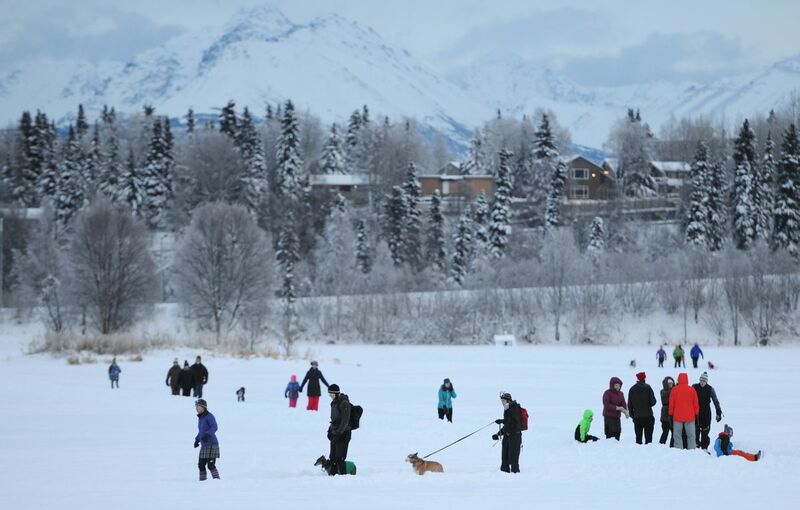 It’s wintertime in Anchorage and, for some, that means it’s time to lace up your ice skates. Maybe you already have. For those who are new to outdoor skating in the city or need a refresher, here’s what you need to know. A half-dozen of Anchorage’s public outdoor ice rinks that aren’t on a lake or pond are currently open for skaters and being regularly maintained, according to the Anchorage Parks and Recreation Department. 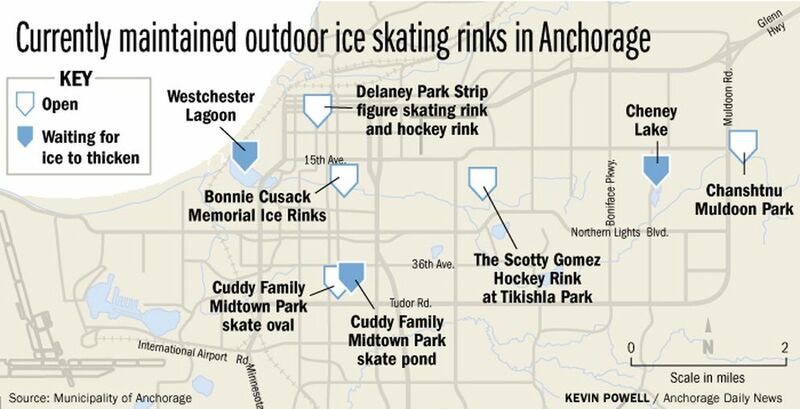 That includes the ice skating path at Chanshtnu Muldoon Park, the Scotty Gomez hockey rink at Tikishla Park in the Airport Heights neighborhood, the speed skating oval at Cuddy Family Midtown Park, and the hockey and figure skating rinks on the Delaney Park Strip, said Josh Durand, Anchorage parks superintendent. If conditions allow, the rinks are hot mopped daily to keep the ice smooth. It’s free to use the rinks. You have to bring your own ice skates. Park hours are generally 6 a.m. to 11 p.m. unless posted otherwise, Durand said. Be aware: Some rinks have permitted events and aren’t always available for open skate. That includes hockey practices and games at the Tikishla rink and the outdoor rinks at the Chester Creek Sports Complex. By Friday, the parks department hadn’t yet hot-mopped its rinks at popular Westchester Lagoon near downtown Anchorage, at Cheney Lake on the east side of town or at a pond in Midtown, Durand said. The ice was still too thin. The parks department won’t send out its hot-mop truck until the ice thickness measures at least a foot, Durand said. The parks department took 19 measurements around Westchester Lagoon on Saturday and the ice thickness was still less than 12 inches, Durand said. The department used a small tractor this week to clear some snow from the lagoon and carve out a skating loop. It won’t start regular maintenance until the ice thickens, Durand said. 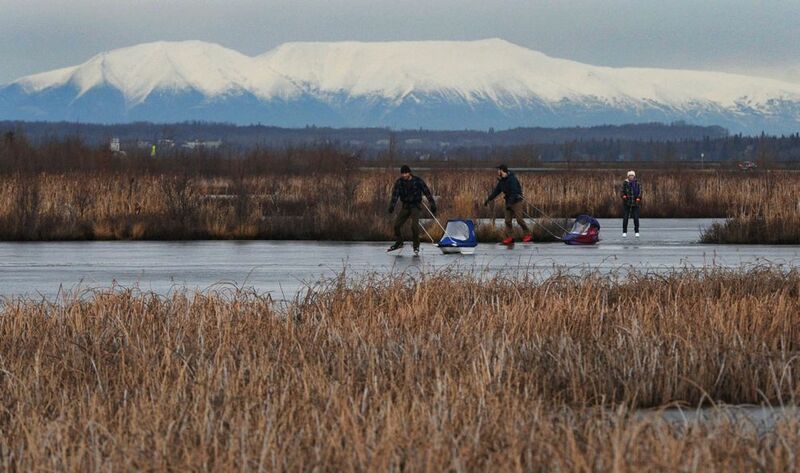 Typically, the Anchorage parks department has already started hot-mopping Westchester Lagoon by late December. Warmer temperatures in October and November coupled with recent snow likely contributed to the delay, Durand said. When the Nov. 30 earthquake shook Southcentral Alaska, it did leave some cracks in the ice. 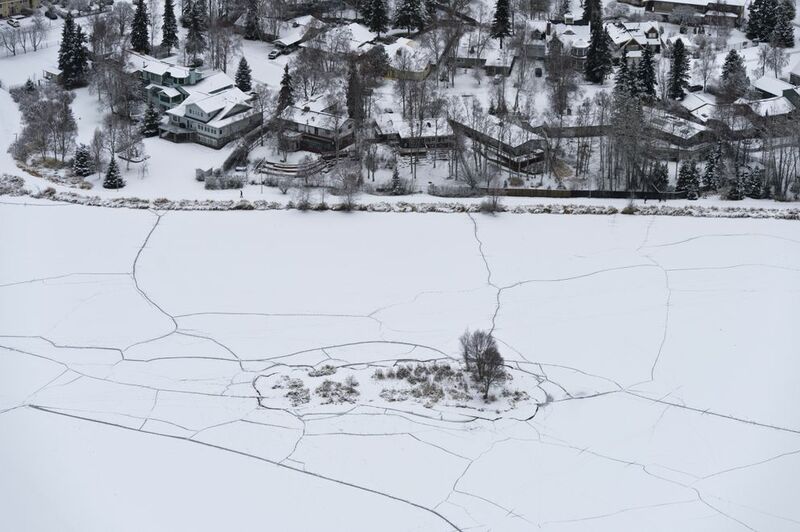 But the ice was so thin on Westchester Lagoon at that point, Durand said, he didn’t think it impacted the freeze. At Cheney Lake, the ice was about 11 inches thick by Thursday, and the parks department was also dealing with overflow — water on top of ice, Durand said. The parks department doesn’t know for sure why the overflow issue is persisting there. At the ice skating pond at Cuddy Family Midtown Park, the ice was about 9 inches thick. The parks department also takes ice measurements at DeLong Lake, Goose Lake and Jewel Lake, though it doesn’t maintain those spots for ice skating. The measurements are logged on the ice and trail status report. In the Eagle River and Chugiak areas, the department measures the ice at Beach Lake, Edmonds Lake and Fire Lake, which are open for ice fishing, but don’t have maintained skating areas, according to the department. There’s a skating rink provided at Mirror Lake, but ice maintenance isn’t being performed. Durand said ice skaters choosing to use Anchorage’s outdoor rinks are skating at their own risk. 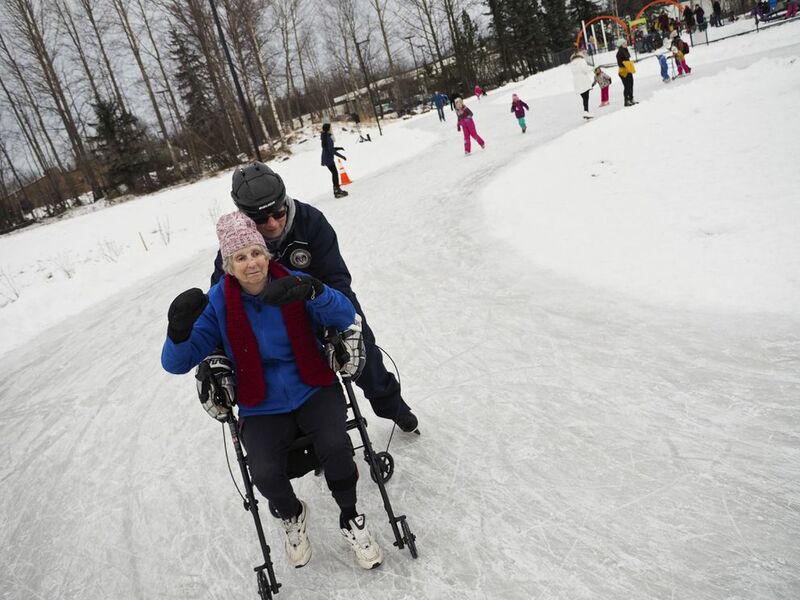 The Anchorage parks department identifies when the ice is safe for maintenance, but not when the ice is safe for people. He referred people to ice-safety guidelines from the Army Corps of Engineers. For a person on foot or skates, ice should measure at least 2 inches thick, the guidelines say. For a group of people walking in a single file line, it’s at least 3 inches. For a 2.5-ton truck, it’s at least 8 inches. Those guidelines only apply to freshwater ice that doesn’t have water flowing underneath. “These guidelines are a good place to start,” said Thomas Douglas, a senior scientist with the Army Corps of Engineers Cold Regions Research and Engineering Laboratory in Fairbanks. There are a lot of variables to consider that can impact how and where ice forms, he said. On rivers, for instance, bends and changing river currents impact ice thickness. Never go out on ice alone and never go out on the ice if there is any question of safety, the Army Corps of Engineers cautions. Always let someone know your plans. Take note of recent and current air temperatures. When you get to the water’s edge, survey the ice. Look for open water and signs of recent changes in water levels. If the ice is covered in snow, look for wet areas in the snow. Also, look for cracks, Douglas said. If water comes up through the cracks, it’s probably pretty thin ice, he said. You can figure out how thick the ice is by drilling holes with a drill or ice auger. Drill holes every 150 feet or so along an intended path, or more frequently if the ice thickness varies. The Army Corps of Engineers has additional tips online. • Dress warm, he said. That means no thin cotton socks. • Remember that outdoor ice is not the same as indoor ice. The outdoor ice might look shiny and smooth, he said, but it can also be marked with irregularities. Skaters should bend their knees more on outdoor ice. Also, look ahead, not down. “Where you look is where you go,” Monroe said. • If you’re skating somewhere and you’re not sure of the ice thickness, don’t skate alone — and be prepared to rescue yourself, he said. That’s more for people skating in the backcountry, he said, but it also applies to spots such as Potter Marsh and Sand Lake, where the municipality doesn’t maintain skating rinks.